hilbert~ is a 6th order hilbert transformer with a minimum of error. clear Clears the object's sample-memory in case of a blow-up. signal In left inlet: The signal that will be hilbert-transformed. The Hilbert transform, or phase quadrature, produces signals that are 90 degrees out of phase with each other. signal: Out left outlet: The "real" part of the hilbert-transformed signal. It will be 90 degrees out of phase from the "imaginary" part. 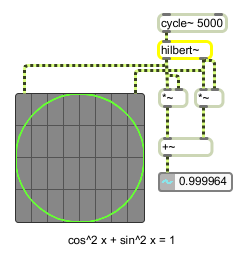 Out right outlet: The "imaginary" part of the hilbert-transformed signal. It will be 90 degrees out of phase from the "real" part.